Be the first to see the incredible offerings by merchants carefully selected from all over the country! Ladies’ Night Out kicks off Deck the Halls with an entertaining night of shopping, food and drinks just for the ladies! The Punch-A-Prize game is back with gift cards from market merchants up to $100. Also, stay tuned for details about an exciting, NEW addition to Ladies’ Night Out! If you would like to return for the rest of the weekend to shop, don’t worry — this ticket includes a three-day market pass. 21 + event. Tickets go on sale September 1st. For a chance to win TWO FREE tickets, share our Ladies Night out event on Facebook. A drawing will take place via Facebook live and the winner will be contacted. More information to follow. 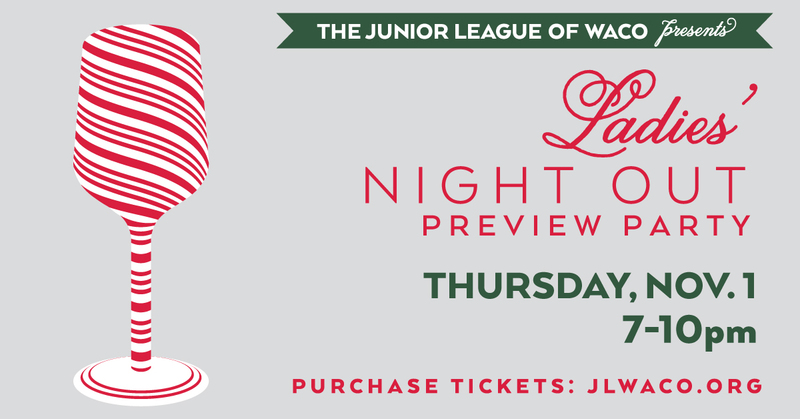 The Junior League of Waco is an organization of women committed to promoting voluntarism, developing the potential of women, and improving our community through the effective action and leadership of trained volunteers. Its purpose is exclusively educational and charitable.